The Bear has been flying with us since she was five weeks old, accumulating just shy of 150 hours by the time she aged four years. But it is important to emphasize that she has been flying with us for all that time, not just me. The Bear has always flown in the back seat and always needed attention - food, drink, and entertainment - that I could not provide while flying. Someone else has always been there to attend to her needs. For every flight save one, that someone was Kristy. Today was a milestone for us, a day over four years in coming. The Bear and I went flying all by ourselves. She was ready to go. I promised that we would do some turns of the sort that Kristy generally does not enjoy (steep ones). I also promised her the front seat for the first time. The Bear supervised preflight carefully. "I am feeling very excited about this flight," I told her as I checked the oil. "I am feeling very silly about this flight," she responded, giving herself antlers with her hands. I raised the Warrior's right seat to its highest position so that she could see out the window and installed her car seat. She was so ready to fly that, halfway through taxi toward the departure end of runway 28 she asked, "Daddy, why aren't we flying yet?" I reminded her of what she already knew; that we had to reach the end of the runway first. 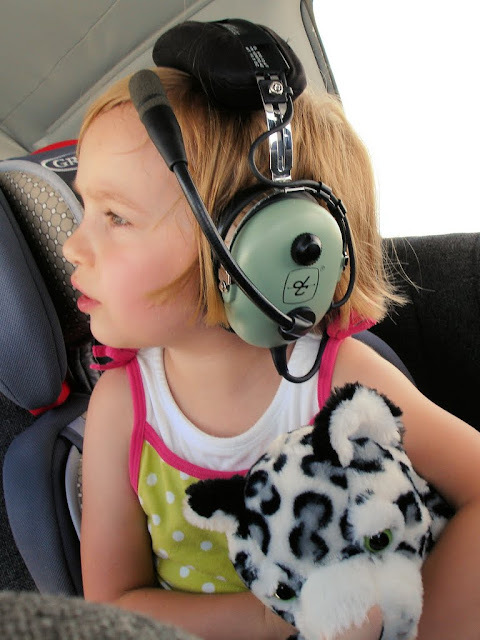 We were still climbing away from the airport into a beautiful, clear blue sky when she inquired, "turns?" I smiled and plead for some patience. I placed the airport at our tail, flew five miles southwest, then cleared the area. "Ready to do some turns?" "Ready!" she shouted on the intercom. "Which way do you want to turn?" I asked. The Bear gestured to the left. I smoothly rolled Warrior 481 into a steep turn to the left. We completed a 360° turn and I rolled the airplane level again. "Wow! That was some turn!" The Bear exclaimed, grinning ear to ear. "Do you want to do that again? Maybe turn toward your side?" "Yes!" Strapped into the right seat, she pumped her legs up and down in excitement. The Bear looked out her window as the right wing rolled toward the Earth. As she stared at the green farmland beyond the wingtip, she commented, "oh...turning this way is MUCH better!" Then, a moment later, "Daddy...I love you." I know that I should cherish those unsolicited declarations for as long as I can still earn them. We did at least five steep turns. On the fourth, I began losing altitude and pulled lightly on the yoke to maintain level flight. 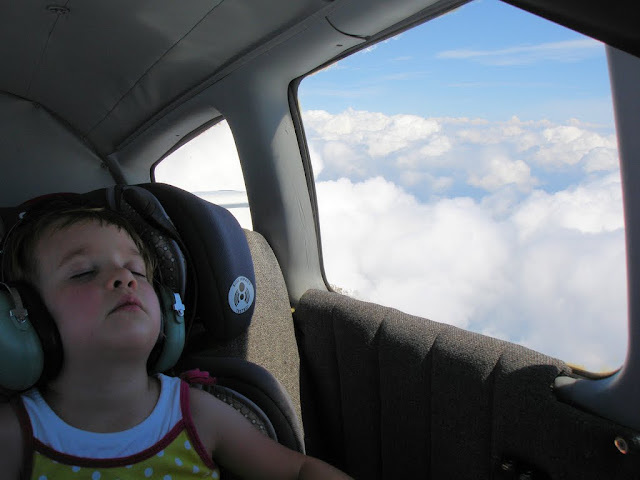 As the airplane g-loaded slightly, I worried how she might react to the sensation. "How are you feeling?" I queried. I worried and briefly contemplated the logistics of coaching a four year old in the use of an airsick bag. We flew past Silver Lake, a narrow body of water with a kink at the end. "That lake looks like a golf club," she commented. I knew that that comment would make my in-laws proud. Several miles away, we could see an array of white posts reaching skyward. "I see windmills!" she cried, pointing at them. They were much too distant for the rotating blades to be visible. Like any experienced aviator, she recognized those windmills with an eye skilled in viewing objects from aloft. We circled Middle Falls at Letchworth. "That's so cool!" The Bear enthused as she watched the Genesee River cascade one hundred feet down the face of a cliff below. We landed at Dansville for lunch and hiked to the family restaurant near the airport. 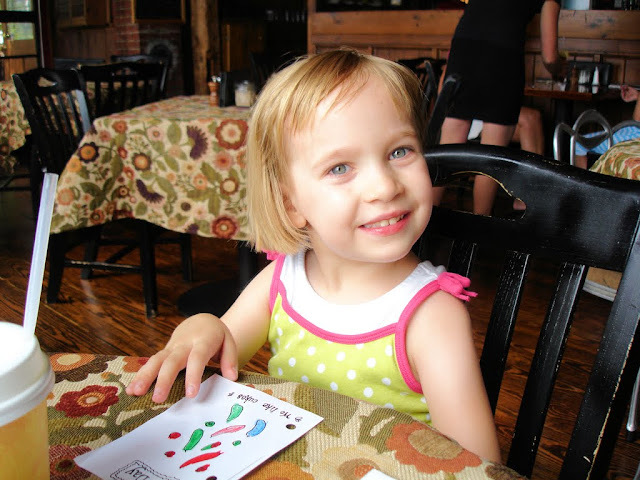 We colored on her placemat together and played Twenty Questions while we waited for our food. I guessed hers (Tweety Bird) and she guessed mine (Belle from Beauty and the Beast). Occasionally, I would glance up and see someone at another table watching us with a smile on their face. I am sure it made for a charming tableau as we played together across the restaurant table. But what others did not - could not - realize was that today's meal went far beyond typical Daddy-Daughter stuff. After a four year wait, The Bear finally became my copilot. Back at the airport, we watched a yellow Piper Pawnee tow a glider aloft. I tried to explain the concept of a glider to The Bear. This this was no simple task. 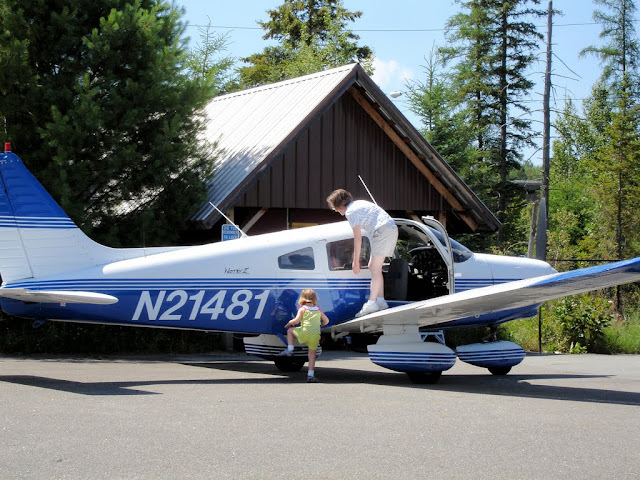 We flew directly back to Le Roy, where The Bear and I cleaned up the airplane and put everything away. She asked to see the pictures I had taken and, when I showed her one of the two of us leaning together and smiling in the cockpit she said, "you should put that one on the blog." Sitting at her workbench, she asked to sign my logbook again. "Fun," she wrote, then signed her name. Rochester, NY is not known for its hot weather. Yet, driving home on Wednesday evening, the outside air temperature was 100°F on the bridge over Irondequoit Bay. Usually, the bay provides some relief from hot weather and brings the temperature down a few degrees relative to the city. Not so this week. Forecasts suggested another hot weekend in the mid 90's, but clear skies and no precipitation. Flying aboard Warrior 481, we turned northeast to the Adirondack Mountains in hopes of beating the heat. Since moving to New York, Lake Placid has become one of my favorite $100 hamburger destinations. The last time The Bear flew to the Adirondacks, she was not quite three months old. Though we stopped in the mountains of North Carolina recently, the weather situation did not lend itself to sightseeing. This time, we were determined that The Bear would actually see some mountains. As we departed from Le Roy, The Bear was actively looking out the window. "There's our hangar! There's our car!" we heard over the intercom as these landmarks dropped away from our climbing airplane. 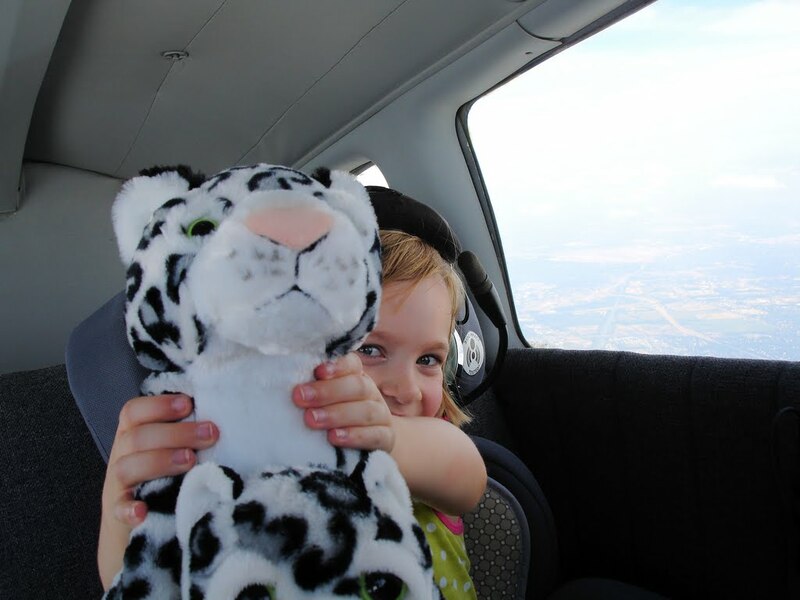 Knowing that I have pilot friends who fly animal rescue missions, The Bear brought her stuffed snow leopards from the Seneca Park Zoo along. If anyone needed saving from the heat, surely it was the snow leopards. With a tailwind at 7500', we averaged close to 140 knots (161 mph) most of the way. 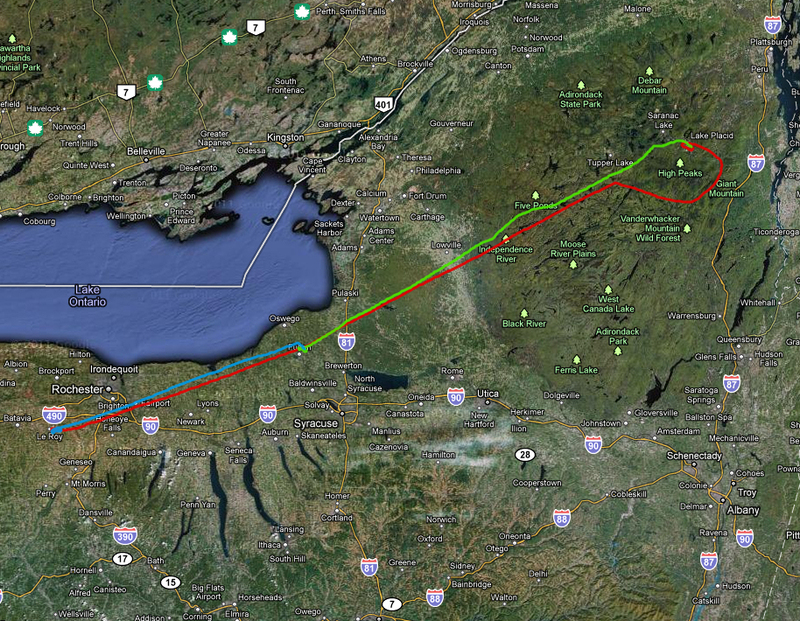 The Lowville and Tupper South, Central, and East MOAs (military operation areas) were cold (inactive) that morning, allowing us to fly a direct route to Lake Placid. 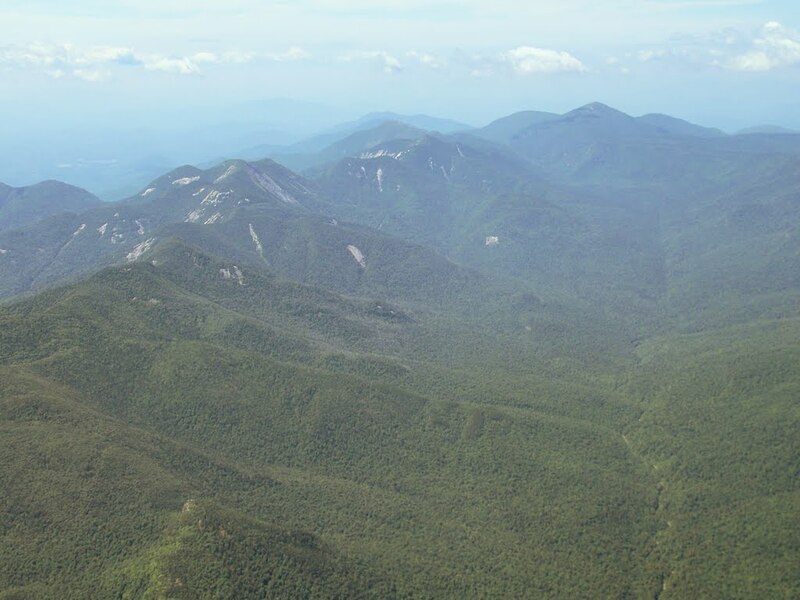 We reached the Adirondack High Peaks surrounding Lake Placid in a short 1.5 hours. 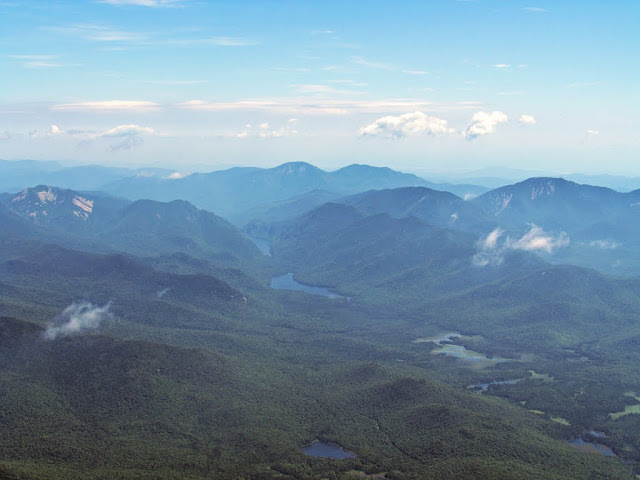 We circled the High Peaks while still talking with Boston Center, flying along a valley marked by Lower and Upper Ausable Lakes (above). "Those mountains are all covered with grass!" The Bear exclaimed. Kristy explained that those were trees, not grass. Even an experienced aviatrix like The Bear sometimes has trouble reconciling the proper scale of things outside her airplane window. After circling the High Peaks, we began a descent toward Lake Placid from the southeast, overflying the airport well above pattern altitude to check the windsock. A Super Cub and a NORDO (no radio) Champ were inbound with the Super Cub making all the radio calls. From our position over the airport it was easy to see the tube and rag aircraft; the Champ a yellow dot over the green landscape with the white Cub in trail. We entered the pattern behind the pair. While the approach was good, I managed to plant Warrior 481 on the runway in a flat, three-point stance. THUMP. We had arrived. On the ramp, we taxied past this jet and parked in a line of other aircraft. 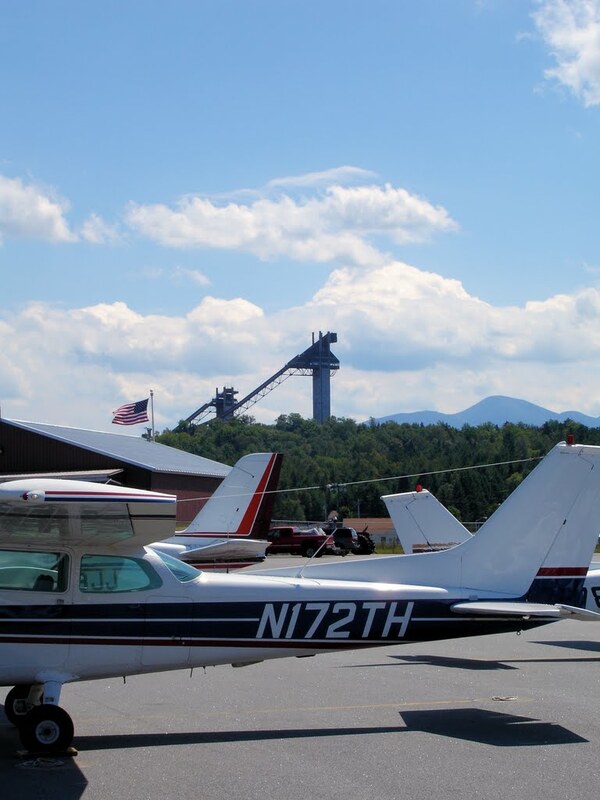 The ski jump facility built for the 1980 winter Olympics towers over the airport. And, is that an ADF antenna on that Cessna? Does anyone still use those? 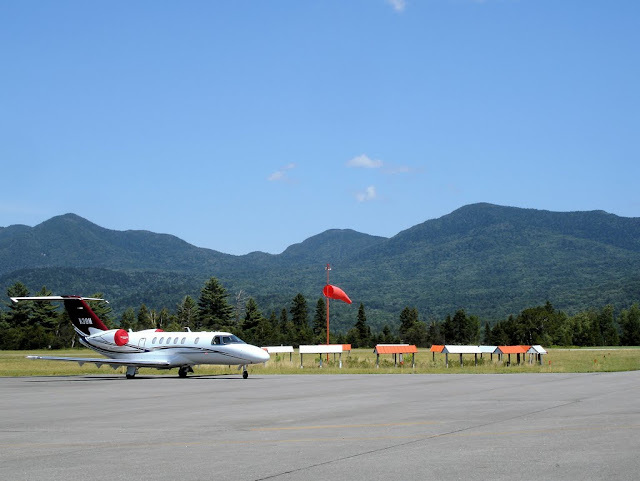 From the ramp of the Lake Placid airport, the view of the mountains was beautiful. Just ask The Bear! It was still warm and sunny in Lake Placid, but easily ten degrees cooler than Rochester. I had investigated the idea of staying the night in Lake Placid, but the Ironman triathlon was scheduled for the next day. As a result, hotel rooms were completely unavailable and the town was packed with people prominently displaying their overdeveloped calves. 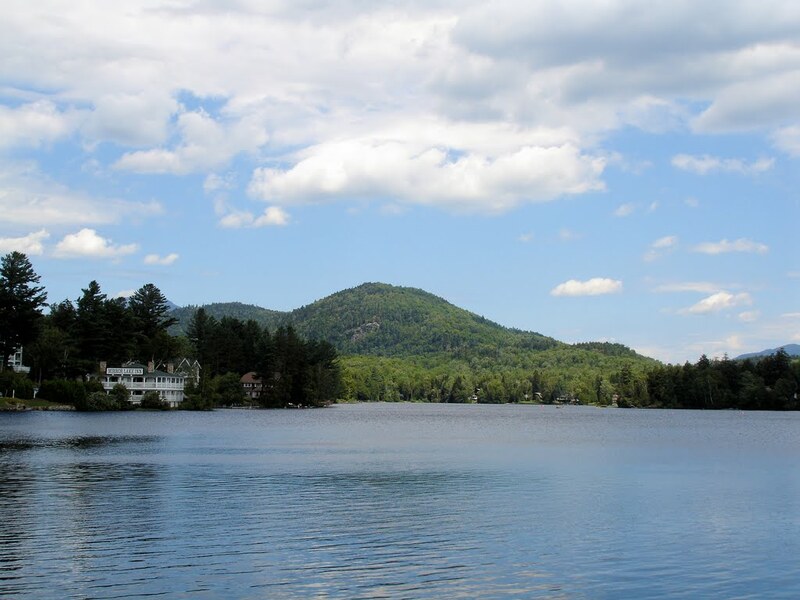 We rode the free Trolley into town, then wandered along the shore of Mirror Lake (above). We finally stopped at The Cottage where The Bear had her very first $100 hamburger four years prior (which was actually milk, not hamburger). We ate at The Cottage for old time's sake. The Bear thoroughly enjoyed her "$100 hamburger", which, in reality, was a plate piled high with fresh fruit. Of course, speaking of reality, the expression "$100 hamburger" may not exactly reflect current pricing anymore. Regardless, we had a nice meal on the shore of Mirror Lake after a beautiful, smooth flight to the mountains. The Bear became tired walking through town, which made us glad that we did not opt to hike up to the 4,867 foot summit of Whiteface Mountain. We assuaged The Bear's exhaustion with some ice cream, which seemed to do the trick. We had the good fortune of catching the Trolley as soon as we finished our ice cream. Back at the airport, Kristy and The Bear entertained themselves on this impromptu balance beam while I saw to refueling the Warrior. Does that Cessna have an ADF antenna, too? Sheesh. 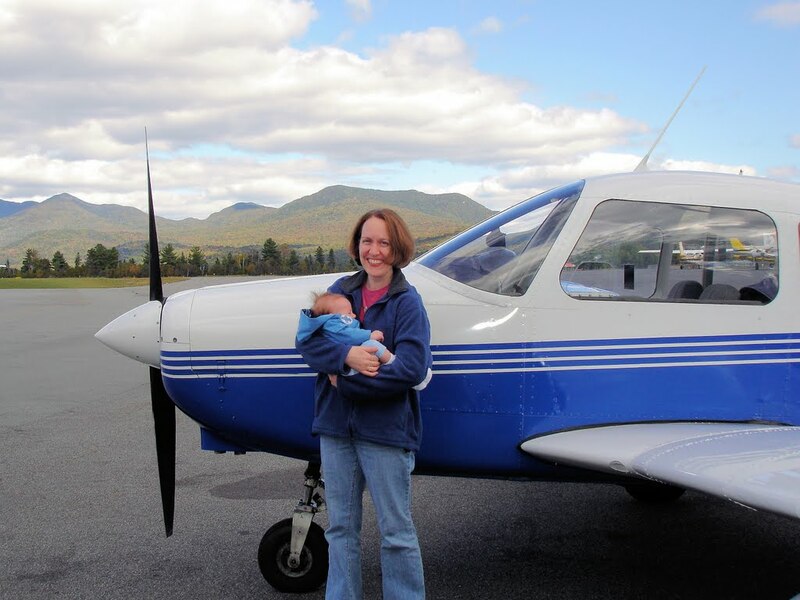 Parked at the fuel pump, we took this picture (above) of Kristy and The Bear to commemorate The Bear's first post-infancy visit to Lake Placid. It was a deliberate attempt to recreate the photo below from September 2007. We loaded back up and took to the sky. 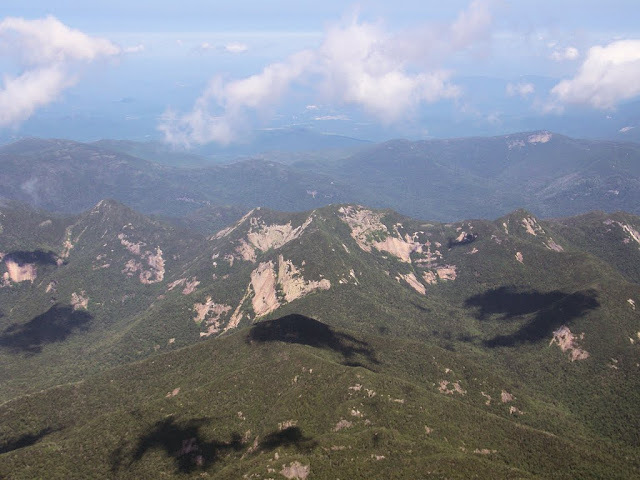 The wind had shifted to a gusty crosswind, which, given the terrain, led to a bumpy climb. Riding through the bumps always puts Kristy on edge and The Bear to sleep. 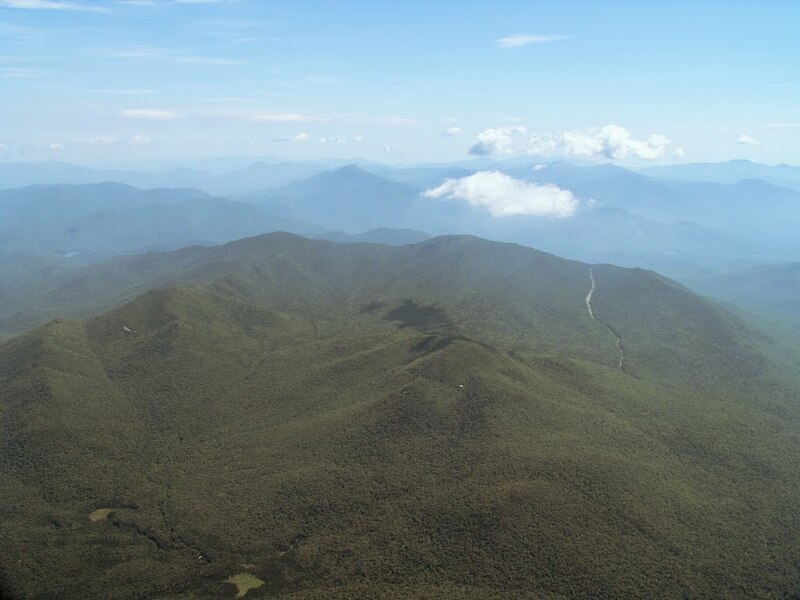 I was able locate and ride some ridge lift at 1,000 feet per minute from about three to five thousand feet, hastening our arrival into cooler, smoother air (love how that mountain flying training still pays off). The bumps worked their usual magic on The Bear, who dropped off to sleep before we arrived at an 8500' cruise altitude against a non-negligible headwind. Our average ground speed was 95 knots, spent over a layer of clouds that varied from scattered to broken. 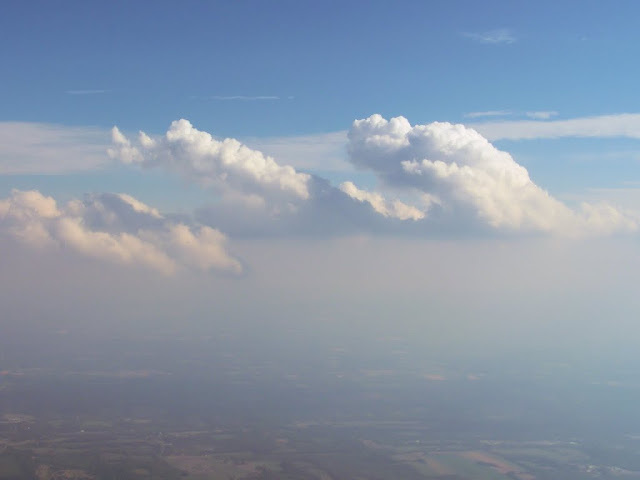 Automated weather reports from Fulton, NY promised clear skies ahead, so we stayed above the clouds in the smooth air and crawled against the current. The wind gradient aloft was sufficient that we saw "leaning towers of cumulus", rather than the standard vertical build ups. 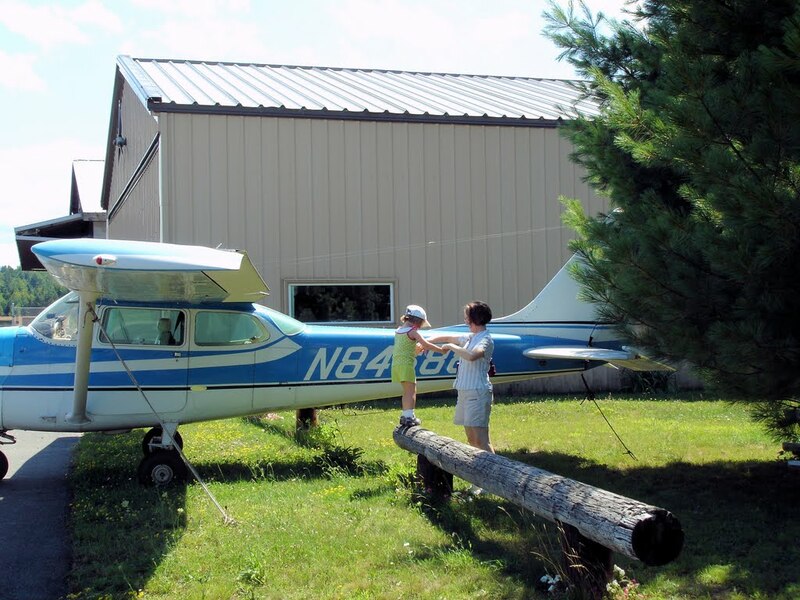 We stopped at the Oswego County Airport (FZY, Fulton, NY) for inexpensive fuel ($5.30/gal). The landing was terrific and helped repair my ego after the clunker in Lake Placid. Sadly, the airport was entirely deserted. 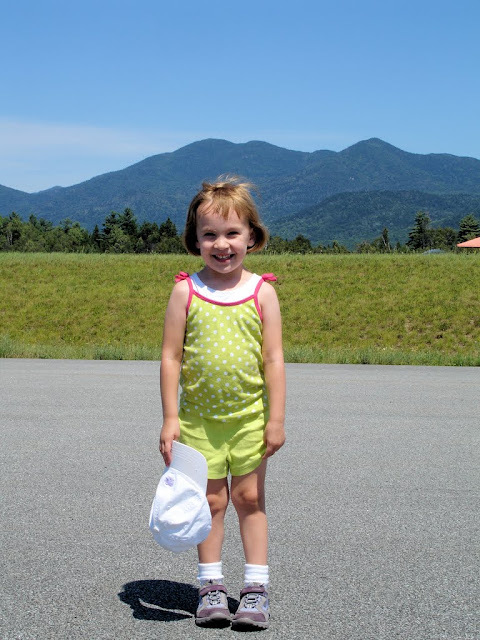 Oswego County is a terrific facility with large, crossing paved runways in excellent condition. We used the FBO computer to update our knowledge of weather conditions in Rochester before climbing back into the hazy sky. 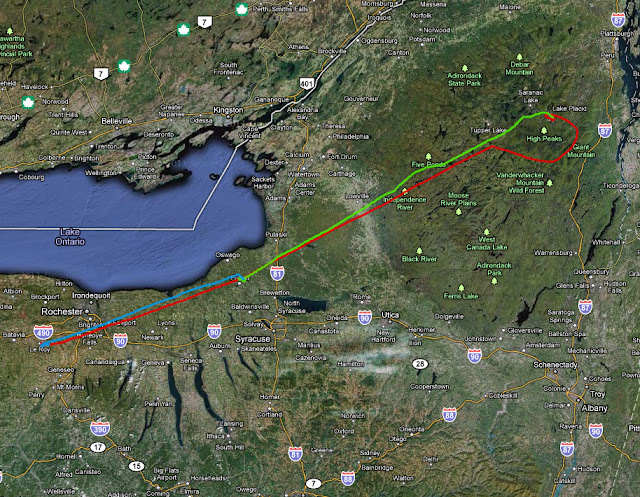 GPS track from the day's flight. Outbound is shown in red, the rest is the return trip. Wiggles in the return flight are deviations around towering cumulus clouds that penetrated our cruise altitude. On approach to Le Roy, Ray's voice appeared on the Unicom. "Warrior 481, winds at the Le Roy International Airport are out of the northwest, about 15 gusting to 20." Evidently, a Canadian aircraft had landed there earlier in the day. Hyperbole aside, he was correct about the winds. I overflew the airport and turned tightly in a descending teardrop maneuver to enter the pattern. "Why are we turning?" inquired The Bear. "We have to approach the airport the correct way," Kristy explained. "I like turning," commented The Bear. That's my girl! Warrior 481 delicately rolled onto the pavement as Ray and Phil watched from the office. "I see Mr. Ray's truck!" exclaimed The Bear. Kristy and I laughed, but privately, I was delighted that The Bear spent so much of today's trip looking out her window. Maybe that means she is starting to enjoy the view as much as I do. I often have first-time passengers write something in my logbook to commemorate the experience in their own words. Though she has been flying with me since she was just a few weeks old, The Bear signed my logbook in her own hand for the first time at the conclusion of this flight. I am not sure which of us was more excited about her signing my logbook. I hate it when a highway stands between me and a deadline. I was driving westbound on I-490 on my way to the airport. My Comm 1 radio was repaired and the shop in Batavia was waiting for me to pick it up and return a loaner radio that had ridden in my panel for a week. My intention was to arrive before 5:00 pm so that no one had to stay late at work on my account. I reached the Le Roy exit at 4:25 pm. It was going to be close. From the airport gate, I recognized the airplane parked next to the fuel pump immediately. Black, sleek, and decorated with sponsorship decals. I knew without looking that a placard on the instrument panel would read, "fly it like you STOLE it". It was the black MX-2 flown by Rob Holland, aerobatic pilot extraordinaire. I have watched Rob perform every year at the Geneseo Airshow and never tire of his routines. Rob is often photographed flying inverted in formation with the Blue Angels. He's the real deal. I am not someone who is often starstruck by celebrity, but here was someone I had genuine respect for. As I waited for the gate to open, I was torn. Arrive at Batavia on time or meet Rob Holland? Easy decision. I looked at my watch again and decided that I would do both. I parked my car at the office and walked down to the fuel pump. Rob was standing with Ray and Ed, swapping flying stories. As I approached, Ed exclaimed, "hey Chris, do you want your picture taken with Rob Holland?" In addition to being an amazing pilot, Rob is a heck of a nice guy. After all, he graciously indulged all of us at the Le Roy airport that afternoon. A member of his team explained to me that they had chosen Le Roy to do their flights with the local media in preparation for the Rochester airshow. As for my radio, I did make it to Batavia on time. Rob was still at Le Roy when I returned. I was chagrined that the landing was one my worst of the year. On departure, Rob skimmed low over the runway and pulled vertical at the departure end. Coming back around, he made a low pass, the air audibly screaming as the MX-2 sliced through it. He gave us a precise wing dip in farewell and joined up with an airborne Bonanza for a photo mission. After Rob left, I had the pleasure of meeting Kim and Laura, who were there visiting Ray. 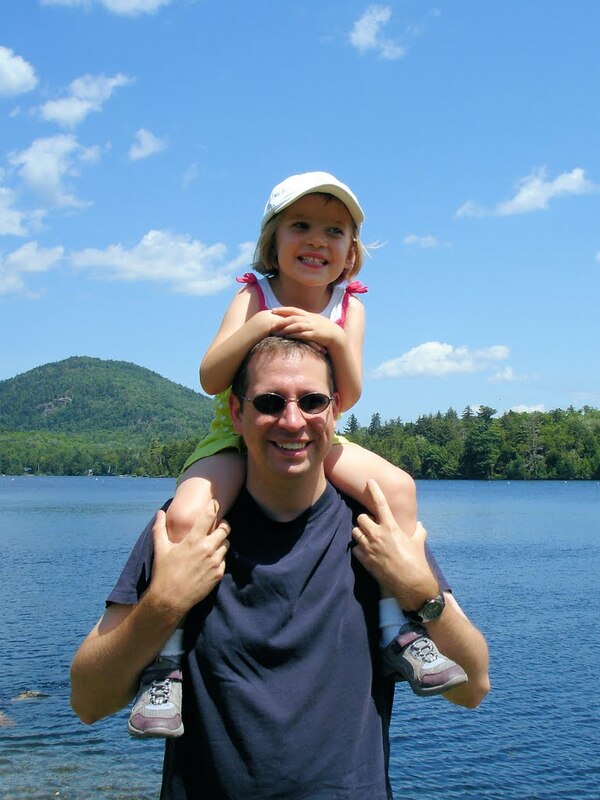 Kim was an old friend of Ray's and Laura was a college-aged girl from France working for Kim as an au pair. 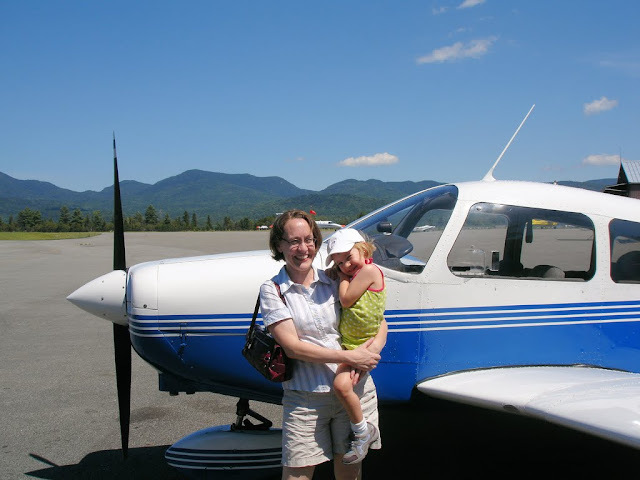 As a favor to Ray, I took Laura for her first ride in a light aircraft. "That was so cool!" she enthused in accented English as we pitched away from the runway (which was by no means as dramatic a maneuver as what Rob Holland had just performed). It was a brief flight, but memorable for me. After all, it was the first time I'd ever taken someone from France for an airplane ride on Bastille Day. For the last several years, I have asked first time passengers to sign my logbook to add a personal touch to the record of that day's flight. "Merci beaucoup pour ce special Bastille Day :-)" she wrote. I came to the airport anticipating a very routine maintenance hop and, instead, met some terrific, unexpected visitors. 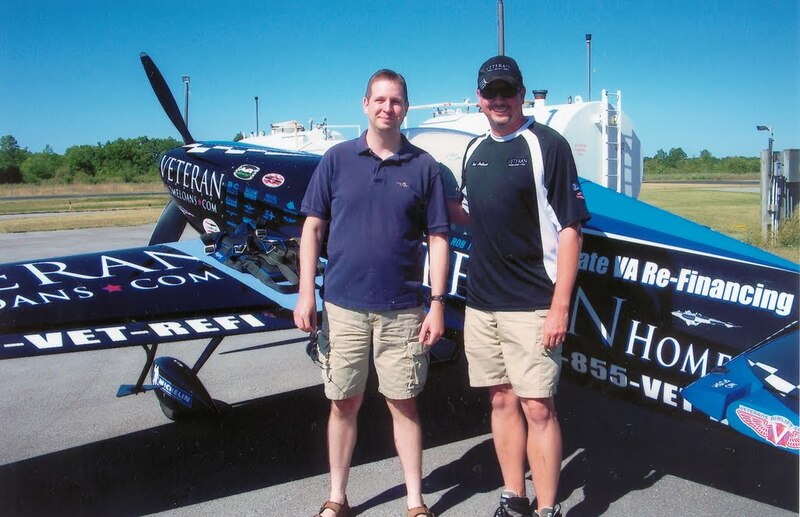 At the end of the Geneseo Air Show, I drove Jim and Jason back to Le Roy for the flight back to Kalamazoo. They launched within minutes of Matt, who was taking a kid for a ride in his Lancair, "Amanda". After an entire day of photographing airplanes, I just couldn't shut it off. So here are pictures of Jim and Matt, departing runway 28 at Le Roy. As I look at these pictures, two things come to mind. The first was that those are some pretty airplanes. The second was that we desperately need some rain in western New York! Kent Pietsch, a newcomer to Geneseo, stole the show in his 1941 Interstate Cadet. The Cadet was made for a limited time by the Interstate Aircraft and Engineering Corporation to train primary military pilots. It's a tandem two-seater comparable to a Piper Cub or Aeronca Champ. According to the announcer, this Cadet had a 90 horsepower engine. The Jelly Belly Cadet first appeared in the middle of an aerobatic routine flown by Rob Holland and Rick Volker. One of the aerobatic aircraft appeared to clip the Cadet, and a yellow aileron fluttered to the ground. Ah, forced perspective - a trick used so effectively by airshow pilots and Peter Jackson. Pietsch flew a drunken newbie aerobatic routine on a single aileron while the show announcer played up the "who is this yahoo?" bit. Later, a wheel was observed to fall from the airplane (though both mains were obviously still attached). Pietsch performed a second routine in the middle of the show with an objective of landing on the roof of a moving RV. To my eye, this looked completely insane. The winds at Geneseo were variable and gusty. The RV was driving on grass, trying to match the Cadet's speed. Owing to the unpredictable winds, it took three tries. The first time, the Cadet slipped off the left side of the platform, veered toward the corn, and seemed to clip some of it as he struggled back into the air. On the third run, Pietsch planted the wheels on the platform. We could see him vigorously working the rudder trying to keep the still-flying tail aligned with the direction of travel in the variable crosswind. He then applied power to crawl along the platform and worked the main wheels into indentations placed near the front. Success! Looks like that RV needs some enhancement to the front suspension. I'll bet that Pietsch needed that toilet paper lying at the base of the RV when this routine was done. ...launched the airplane back into the sky. This was simply incredible to watch. Sure, the raw power of the Viper West F-16 demonstration was impressive, but the airmanship we saw Pietsch demonstrate that afternoon was truly amazing. Pietsch parked the Cadet close to where we were standing and emerged. Not some aeronautical deity, but just an ordinary looking guy. The woman next to me gushed, "that was so, so, so, so, so AWESOME!" Pietsch laughed. "What she said!" I added, and earned another chuckle. Jim commented, "I can't believe you're not sweating more!" "I don't know about that," Pietsch replied. He pulled his hat off of his head and displayed a moist pate. "Did you used to be a crop duster?" asked someone next to us. "Yup," Pietsch answered him with a modest smile. After all the warbirds, the aerobatic acts, the C-130 and Viper demonstrations, Pietsch closed out the show circling the field at 6000' while Enya's "Sail Away" played over the sound system. He shut down the engine and performed a gorgeous dead-stick aerobatic routine with cotton-candy smoke streaming from the Cadet's wingtips. Below, Pietsch's RV driver stood in the middle of the runway waiting patiently. When it finally ran out of altitude and energy for aerobatics, the Cadet slipped to the turf and rolled down the runway. The Cadet rolled slower and slower, finally stopping just as the hub of the prop made contact with the palm of RV driver's outstretched hand. What an amazing, quiet, dignified end to an afternoon dominated by the roaring of propellers and the shriek of turbine engines. And to think, I actually considered not going this year! On July 9, 2011 I went to the always enjoyable airshow in Geneseo, NY, "The Greatest Show on Turf". I was accompanied by friends Jim and Jason, who flew out from Kalamazoo the night before. Kevin Russo was flying his beautiful T6 Texan, advanced World War II era trainer, when we arrived. As always, there were a plethora of T6 in Geneseo for the show. This included the Canadian Harvard Aerobatic Team, a mainstay at Geneseo. I love the sight of those yellow birds against a crisp blue sky. "The Movie" Memphis Belle, the hometown favorite, flew. As well as the 1941 Historical Aircraft Group's own C-47, "Whiskey Seven". Whiskey Seven took to the skies to drop some meat missiles in authentic WWII military garb onto the field. a Vultee Valiant with an eye-catching paint job, and many, many more. One disappointment of the day was that the grass runway was deemed too soft for the C-130 Hercules to land. Instead, the Hercules did an aerial drop demonstration that did not go quite as planned. The payload wound up in the adjacent cornfield. There was also a contingent of World War I replica aircraft flying. The Red Baron entertained himself chasing aircraft around the sky. This was tremendous fun until another Fokker triplane lost its engine and clipped the corn on his way back to the runway. The aircraft made a partial cartwheel, then came to a stop in a cloud of dust. Happily, the pilot seemed to be ok. The triplane, not so much. Finally, though not in a warbird, Rob Holland did a magnificent solo aerobatic routine in his MX2. I never tire of watching this guy fly. The problem here is that I can hardly ever get a decent shot of Rob because he's always moving too fast and my camera is SLOW. Regardless, it was one heck of a great day in Geneseo!